As of this release, Starbucks Mobile Order & Pay has expanded to participating stores in Canada and the UK. Now you can use your mobile phone to see what music is playing in the background and grab a copy of the playlist. The Android app's Play Store page is already showing the new feature. Those of you who aren't already using the app, which also lets you make purchases ahead of time, can grab it from the link below. 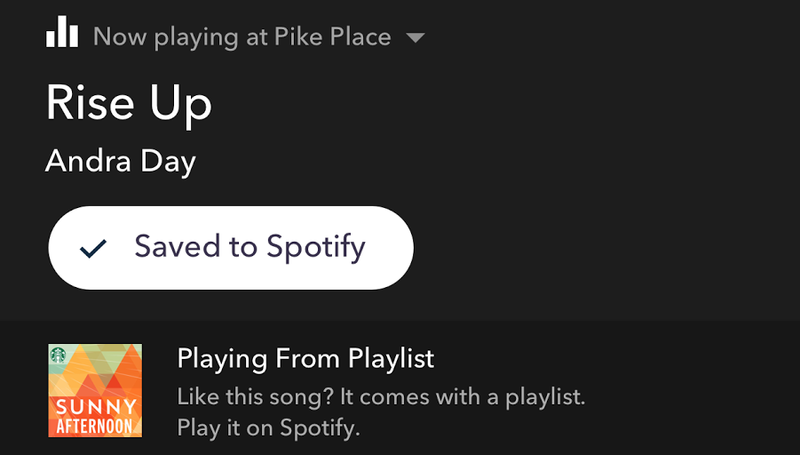 *This functionality and in-store overhead music experience provided by Starbucks. **Continued use of GPS running in the background can decrease battery life. SEATTLE--(BUSINESS WIRE)--Today, Starbucks Coffee Company (NASDAQ:SBUX) launched a new digital music experience with leading streaming music service Spotify, allowing Starbucks Mobile App customers to immediately discover music playing overhead at Starbucks® stores, save Starbucks-curated songs to a playlist on Spotify and listen to Starbucks music anywhere they go on Spotify1. This first-of-its kind music experience reaches customers at more than 7,500 Starbucks company-operated stores in the U.S., 10 million My Starbucks Rewards loyalty members, and U.S. Spotify users. The new Starbucks music platform is available to both iPhone and Android users within Starbucks Mobile App, offering customers the personalized experience they have come to expect from both companies. 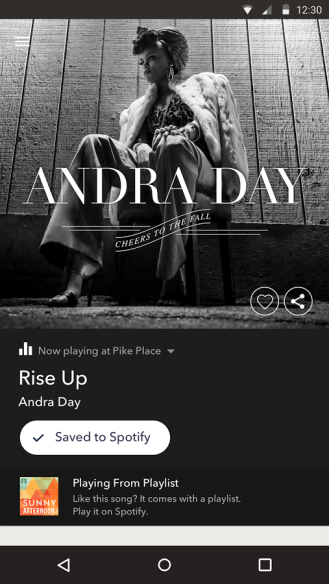 In addition to being able to discover music playing overhead at a participating Starbucks store, Starbucks Mobile App users will now be able to view recently played songs, save songs to a personal playlist on Spotify, “Love” songs to influence future Starbucks playlists as well as share these songs on social networks and “Play on Spotify.” Spotify users can also find new playlists from Starbucks as well as Starbucks most popular music from the past 20 years on Spotify. 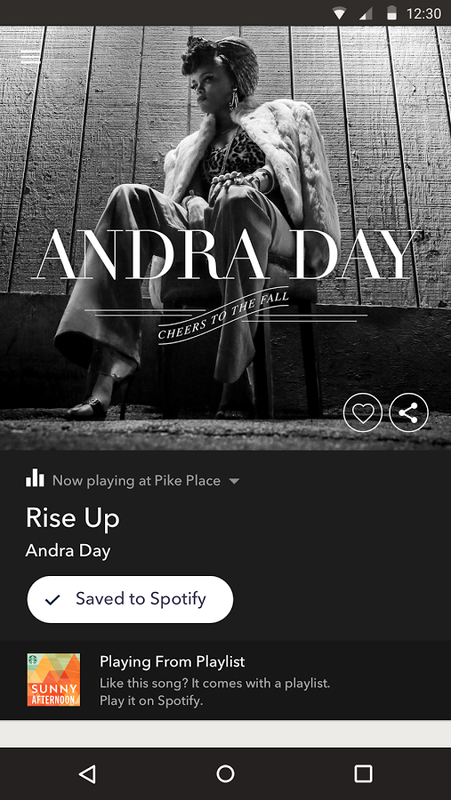 These features are accessible on Spotify’s Free and Premium services. Starting in January, Starbucks will also begin a new weekly feature in the Starbucks app highlighting both established and emerging artists, as well as curated playlists giving musicians a new way to reach millions of customers across the U.S. Starbucks partners have also begun influencing the music played in their stores by choosing from a variety of Starbucks curated playlists and creating “Store Favorites” playlist. This is made possible via a mobile app, powered by a new, PlayNetwork CURIO hardware device that delivers branded entertainment and media to retail stores. For more than four decades, Starbucks has built a differentiated third place experience with music at the heart of its coffeehouse culture. In 1994, a dedicated entertainment team began selecting original CDs spanning a diversity of musical genres and geographies. This program has spotlighted the extraordinary careers of legendary artists such as the late John Lennon, Aretha Franklin and Bonnie Raitt, among many others. Bob Dylan, Yo-Yo Ma, the Rolling Stones and Ray Charles are among the legends who identified their favorite recordings for Starbucks® Artist Choice series. Starbucks seasonal CDs have celebrated moments ranging from Valentine’s Day to summer road trips to holiday festivities. Starbucks has also become a champion of once emerging artists such as John Legend, Madeleine Peyroux and Fleet Foxes, introducing customers to these musicians at an early point in their careers.